This post collects some information and my own experience about setting up a headless raspberry pi – this means there is no keyboard, monitor or mouse connected to the raspi. All the communication to the user is done via ethernet. In my case there’s also no graphical interface. There is nothing new in this article. It is a compilation of information found at different places over the internet. But as it took me some time to find it I thought it could be helpful to have it all in one place. The operating system of a raspi is on a SD card or micro SD card depending on which raspi you choose. 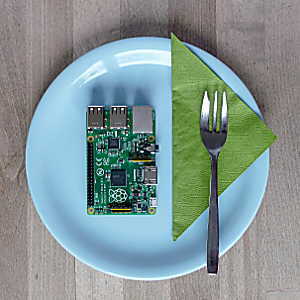 The raspberry pi foundation publishes different images of the preinstalled operating system. So you only have to copy the image to your SD card, plug it into the raspi and then the raspi starts directly from the SD card. No further installation needed. 🙂 The raspberry pi foundation has detailled information on how to prepare the SD card here on a Linux machine. This is what I did (mostly) – and failed. So here is one of the reasons I’m writing this post. The other possibility is to use a preinstalled SD card that contains NOOBS. This is not covered here. I found an old 8GB micro SD card lying around – perfect for my pi B+. So I followed the instructions, copied the image to the SD card but the raspi didn’t do anything. It took me some time to find out that the card was faulty and data was corrupted. In a terminal go to the directory where the zip file lies. type md5sum 2017-01-11-raspbian-jessie-lite.zip and compare the result with the md5 sum that is given on the download page. Now find out the device name your computer gives to the SD card. Therefore type in the terminal: df -h before you insert the SD card. After you’ve inserted the SD card type df -h again. The newly appeared device is the SD card, e. g. /dev/sdd where /dev/sdd1 is the first partition on that device and /dev/sdd is the name of the whole card. If no new device appeared you probably see a new symbol on the desktop. Right-click it and mount it. Then you should see it in the df -h output. The next step is to unmout the SD card from the filesystem. If your SD card is at /dev/sdd you type umount /dev/sdd1 If your SD card has several partitions as can be seen in the output of df -h then unmount all other partitions of the card, too. sudo dd bs=4M if=2017-01-11-raspbian-jessie-lite.img of=/dev/sdd and replace /dev/sdd with the name of your SD card!!! You can also become root and use dd without sudo. This is the same with all following commands. If the block size 4M doesn’t work try with 1M which will take longer. While dd writes to the card you will get no output. At the end there is an output that tells you what dd has done, You can also see the write speed of your SD card. Before plugging out the SD card type sync in your terminal to have the write cache flushed. Then you can remove the card. This is what you have to do to be sure that everything is ok on your SD card. Now your ssh connection is up and running 🙂 Change the password with the passwd command to your individual password to prevent others being able to log in with the standard password. This entry was posted in Uncategorized and tagged headless, raspberry on February 12, 2017 by heliosoph. sudo dd bs=4M if=2017-01-11-raspbian-jessie-lite.ZIP should be IMG, i.e. sudo dd bs=4M if=2017-01-11-raspbian-jessie-lite.img of=/dev/sdd. Corrected. Thank you very much! !